Singapore Ultramarathon 2009 will be held on Saturday Night, 30th May 2009. The registration for it will be open in December 2008. 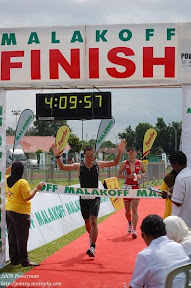 So those of you who think marathon running 42km is not enought or too easy for you, then why not challenge yourselves to do ultramarathon 84km (42 x 2 laps). Register early because it is only limited to a few hundred runners. I remember last December 2007/January 2008, it only took them 1 month, and the registration for Ultramarathon was closed. I'm going to register and start my training as early as next year. This year I started my training around March - a bit late.